Objective To evaluate the clinical effectiveness of two modes of cognitive–behavioural therapy (CBT) for IBS compared with treatment as usual (TAU) in refractory IBS. Design A three-arm randomised controlled trial assessing telephone-delivered CBT (TCBT), web-based CBT (WCBT) with minimal therapist support, and TAU. Blinding participants and therapists was not possible. Chief investigator, assessors and statisticians were blinded. Participants were adults with refractory IBS (clinically significant symptoms for ≥12 months despite first-line therapies), recruited by letter and opportunistically from 74 general practices and three gastroenterology centres in London and South of England between May 2014 to March 2016. Co-primary outcomes were IBS Symptom Severity Score (IBS-SSS) and Work and Social Adjustment Scale (WSAS) at 12 months. Results 558/1452 (38.4%) patients screened for eligibility were randomised: 76% female: 91% white: mean age 43 years. (391/558) 70.1% completed 12 months of follow-up. Primary outcomes: Compared with TAU (IBS-SSS 205.6 at 12 months), IBS-SSS was 61.6 (95% CI 33.8 to 89.5) points lower (p<0.001) in TCBT and 35.2 (95% CI 12.6 to 57.8) points lower (p=0.002) in WCBT at 12 months. Compared with TAU (WSAS score 10.8 at 12 months) WSAS was 3.5 (95% CI 1.9 to 5.1) points lower (p<0.001) in TCBT and 3.0 (95% CI 1.3 to 4.6) points lower (p=0.001) in WCBT. All secondary outcomes showed significantly greater improvement (p≤0.002) in CBT arms compared with TAU. There were no serious adverse reactions to treatment. Conclusion Both CBT interventions were superior to TAU up to 12 months of follow-up. IBS is common and many people with IBS have ongoing symptoms that significantly affect quality of life. Face-to-face cognitive–behavioural therapy (CBT) has been shown to be helpful for IBS and is recommended in National Institute for Health and Care Excellence guidelines but there is limited evidence for telephone and web-based CBT and uncertainty regarding participant’s adherence to CBT and its longer term effectiveness. Currently there is poor availability of CBT for people with IBS. This is the first large randomised controlled trial in primary and secondary care with long-term follow-up to compare low-intensity web-based CBT for IBS and higher intensity telephone-delivered CBT for IBS with treatment as usual. Both the telephone-delivered and web-delivered CBT for IBS showed large clinical and statistically significant improvements in IBS symptoms and impact on life and mood which were maintained at 12 months. Good adherence to treatment and sustained improvements in IBS at 12 months can be achieved with telephone and web-based CBT for IBS. Currently clinicians have few options to offer people with refractory IBS, particularly in primary care. This study shows that IBS-specific CBT has the potential to provide significant improvement in IBS symptoms, within a National Health Service (NHS) setting (NHS therapists delivered the interventions). All therapy was offered remotely so could be made nationally available from specialist therapy centres. In addition, therapists who currently work in the Improving Access to Psychological Therapy services (available throughout England) have suitable skills and are well placed to provide CBT for IBS. Potential treatment pathways could be a ‘matched’ approach where people with IBS are initially offered the most appropriate type of CBT based on initial assessments or a ‘stepped care’ care approach where all patients are offered lower intensity web-based CBT and further therapist input is considered for those with particularly troublesome symptoms. IBS is a common GI disorder affecting 10%–20% of the population worldwide and incurring significant health costs.1 2 Abdominal pain, bloating and altered bowel habit affect quality of life, social functioning and time off work.3 Treatment commonly relies on a positive diagnosis, reassurance, lifestyle advice including diet and drug therapies.3 4 However, many patients suffer ongoing symptoms. Psychological therapies and particularly face-to-face cognitive–behavioural therapy (CBT) can reduce symptom scores and improve quality of life by targeting unhelpful beliefs and coping behaviours5–8 but questions remain over optimum modes of delivery, adherence to therapy and longer term outcomes. The National Institute for Health and Care Excellence (NICE) guidance3 recommends CBT for patients with refractory IBS symptoms (ie, ongoing symptoms after 12 months despite being offered appropriate medications and lifestyle advice). Even assuming there were no questions about the longer term effectiveness of CBT, there is very limited access for patients with refractory IBS to traditional intensive face-to-face CBT. Within resource-constrained health services, telephone-delivered CBT (TCBT) and web-based CBT (WCBT) are likely to provide an important way of improving access and have the advantage of access at a time and place convenient to the participant, at a pace that suits individual’s circumstances, without additional travel time and costs. Previous trials show provisional evidence for WCBT (with some therapist support) in IBS.9–13 However, to date there are no large effectiveness randomised controlled trials (RCT) of WCBT for IBS compared with treatment as usual (TAU). The aim of the Assessing Cognitive–behavioural Therapy in Irritable Bowel syndrome (ACTIB) trial was to compare clinical and cost-effectiveness of therapist TCBT and WCBT (Regul8) with minimal therapist support with TAU alone16 at reducing IBS symptoms and impact. ACTIB was a parallel three-group, multicentre randomised trial with outcomes assessed at 3, 6 and 12 months after randomisation for patients with refractory IBS. Primary endpoint was 12 months. We recruited UK National Health Service (NHS) patients from 74 primary care general practice (GP) surgeries in Southern England and London and three secondary care gastroenterology outpatient clinics in Southampton and London, May 2014 to March 2016. Twelve-month data collection completed in May 2017. Participants were eligible if they fulfilled criteria for refractory IBS at screening, defined as: fulfilling ROME III criteria for IBS17; reported ongoing clinically significant symptoms on IBS Symptom Severity Score (IBS-SSS),18 that is, ≧75; had been offered first-line therapies (eg, antispasmodics, antidepressants or fibre-based medications); and had IBS symptoms ≧12 months. Due to the increased risk of bowel cancer, potential participants aged >60 years were only included if they had hospital consultant review ≤2 years to confirm symptoms were IBS related and exclude serious bowel conditions. Medical exclusion criteria: unexplained rectal bleeding or weight loss, IBD, coeliac disease, peptic ulcer disease, colorectal carcinoma. Other exclusions: patients <18 years, unable to participate in CBT due to speech or language difficulties, no access to internet computer, received CBT in the last 2 years, previous access to Regul8 during MIBS trial, currently participating in another IBS intervention trial. Primary care patients were identiﬁed by searching GPs’ lists for those with an IBS diagnosis and opportunistic recruitment of patients with IBS. An invitation letter was sent including a patient information sheet and a reply slip. Most secondary care recruitment was opportunistic during gastroenterology clinics. Adverts were also placed in GP and gastroenterology clinics and on NHS websites. The trial team undertook initial telephone eligibility screening; any suggestion of serious pathology, such as unexplained weight loss, triggered GP referral for further assessment. Online consent preceded screening blood tests: full blood count, C-reactive protein and tissue transglutaminase (as per NICE guidelines3). If blood tests were within normal limits, participants were able to take part. After completing baseline questionnaires, participants were randomised to one of the three trial arms. Randomisation was at the level of the individual, stratified by recruitment centre, with randomly varying block sizes to ensure approximately equal group sizes. Randomisation was implemented via an independent web-based randomisation service at the UK-CRC registered King’s Clinical Trials Unit. As with any therapy trial, participants, therapists and research assistants assisting with therapy arrangements could not be masked to treatment allocation. However, trial principal investigators and statisticians undertaking outcome analysis were masked. Outcomes were completed by participants independently of the study team. Two interventions were assessed: therapist TCBT and a low-intensity WCBT—an update of the Regul8 programme developed in MIBS9 including eight online sessions, with some therapist support. All arms received TAU, control being TAU alone. The CBT content of the treatment arms was similar, based on an empirical cognitive–behavioural model of IBS,19 consisting of education, behavioural and cognitive techniques, aimed at improving bowel habits, developing stable healthy eating patterns, addressing unhelpful thoughts, managing stress, reducing symptom focusing and preventing relapse. Treatments were standardised by provision of training, supervision and manuals for therapists. All therapists were able to be allocated to participants from all recruitment centres and either therapy arm. Participants randomised to TCBT arm received a detailed self-help manual including homework tasks and had six 1-hour telephone sessions with a CBT therapist at weeks 1, 2, 3, 5, 7 and 9. They also received two 1-hour booster sessions at 4 and 8 months (total 8 hours of therapist support). WCBT participants received online access to Regul8 and three 30 min telephone therapy calls at weeks 1, 3 and 5, and two 30 min booster sessions at 4 and 8 months (2.5 hours of therapist support). TAU was a continuation of current medications and usual GP or consultant follow-up with no psychological therapy. All GP and secondary care sites received NICE guidance for IBS3 and a deskside reminder highlighting protocol guidance and inclusion criteria. All participants received a standard information sheet on Lifestyle and Diet in IBS based on NICE guidance.3 Information was collected on any changes in IBS treatments/management and numbers of GP and consultant consultations were recorded for all trail arms. TAU alone participants were given access to WCBT website (but no therapy support) at the end of the 12-month follow-up period. Thirteen therapists trained in cognitive behavioural psychotherapy (10 [77%] female, mean age 42 years [range 34–52]) based at South London and Maudsley NHS Trust provided telephone CBT sessions for both therapy arms. Six therapists were clinical psychologists (46%) and seven (54%) were cognitive behavioural psychotherapists with a median of 7 years (range 4–24) experience. All sessions were audio recorded for supervision and treatment fidelity purposes. Therapists received a therapist manual, 2 days’ training and supervision. TC and RMM listened to one therapy tape per therapist per supervision session which were conducted in 90 min fortnightly group sessions in the first half of the trial, then monthly. Fidelity was rated by two independent clinical psychologists using a fidelity measure specifically adapted for this trial.20 A random sample of 22/90 WCBT second sessions (24.4%) and 23/103 (23.3%) TCBT third sessions were rated. Of 45 randomly selected recordings, nine were double rated (20%) and discussed between raters to ensure consistency. Percentage agreement in scale items was 83.95%–99.31%. Double ratings showed adequate inter-rater reliability (ie, weighted kappa range 0.50–0.97) for all items except one, which had a weighted kappa of 0.11. IBS-SSS and WSAS at 3 and 6 months after randomisation, and mood, symptom relief and ability to cope with symptoms at 3, 6 and 12 months. Patient Enablement Questionnaire (PEQ)22 assesses participants’ ability to cope with their illness and life after treatment, scored 0–12, higher scores indicating improvement. SGA and PEQ were not measured at baseline. Adherence to therapy was defined as the number of phone or web sessions undertaken: WCBT completing ≥4 website sessions and one or more telephone support calls; TCBT completing ≥4 of the initial telephone CBT sessions. Participants self-reported adverse events (AE) in follow-up questionnaires. Clinicians and therapists reported serious AEs on a standard form. An intention-to-treat (ITT) approach was used. For each outcome and assessment time point (3, 6 or 12 months) we estimated the effect of treatment (TCBT or WCBT) compared with TAU to assess treatment effectiveness. Significance testing was performed at Bonferroni adjusted significance level alpha=0.025 to allow for two primary outcomes. Modelling of continuous variables relied on normal assumptions for error terms and treatment effects were quantified by trial arm differences (and standardised differences). To facilitate modelling, the PEQ measure, which displayed considerable zero inflation, was reclassified as a binary variable, a score of ≥6 considered a ‘responder’. Binary outcome variables were analysed within a logistic regression framework and treatment effects quantified by ORs. Formal trial arm comparisons were carried out by multiple imputation (MI) using the flexible Multivariate Imputation by Chained Equations (MICE) approach.26 Necessary as non-adherence with treatment was found predictive of missing primary outcomes at 12 months in CBT arms. MI can provide estimates of trial arm differences valid under such a ‘missing at random (MAR)’ process27 (details in online supplementary appendix 1). We also empirically assessed whether baseline variables were predictive of missing data using logistic regression modelling of missingness at 12 months at a liberal 20% test level (see online supplementary appendix 2). More severe baseline IBS-SSS and index of multiple deprivation (IMD) predicted missingness so we included these variables in the imputation to allow for a realistic MAR process. Separate analyses were carried out for each outcome variable and time point. MICE was used with regression or logistic regression imputation models for continuous and binary variables, respectively. Predictive mean matching (10 nearest neighbours) ensured imputed IBS-SSS, WSAS and HADS values lay within the observed data range. One hundred imputations were used throughout. MI analysis models included the respective outcome variable as the dependent variable, and trial arm (two dummy variables indicating the TCBT and WCBT arms), baseline values of outcome and randomisation stratifier (dummy variables for four levels) as explanatory variables. Since both TCBT and WCBT involved therapists delivering the intervention possible therapist effects were investigated (see online supplementary appendix 3 for procedures to select the model for therapist effects). We detected therapist effects in TCBT arm for IBS-SSS, SGA responders and PEQ responders at 12 months and allowed for therapist-varying random intercepts in TCBT arm for these variables. For binary outcomes affected by therapist effects estimated ORs were conditioned on the therapist. The OR was marginalised across therapists within a stratifier level to ensure that all quoted ORs estimate the same effect size measure (OR of treatment within a centre). For each outcome variable, the MI imputation model included (1) all variables of the analysis model, (2) measures of outcome variable at other assessment time points including baseline, and (3) known predictors of missingness (binary adherence variables for each of TCBT and WCBT, IBS-SSS and IMD). For analysis models that contained (random) therapist effects, (4) fixed effects for therapists in TCBT arm were also added. Relevant model assumptions were checked, including normality and homogeneity assumptions, and found satisfactory. Results of complete case analyses are provided in online supplementary appendix 4. Four sensitivity analyses were conducted. Their purpose and technical details are provided in online supplementary appendix 5. All analyses were carried out in Stata version14.2. Trial results will be emailed to all participants and published on the trial website. Five hundred and fifty-eight (38.4%) of 1452 patients screened for eligibility were recruited, May 2014 to March 2016: 186 were randomised to TCBT, 185 to WCBT and 187 to TAU. Figure 1, Consolidated Standards of Reporting Trials, describes participants’ journey. The most common ineligibility reasons were: failure to have refractory IBS or not being offered first-line therapies. 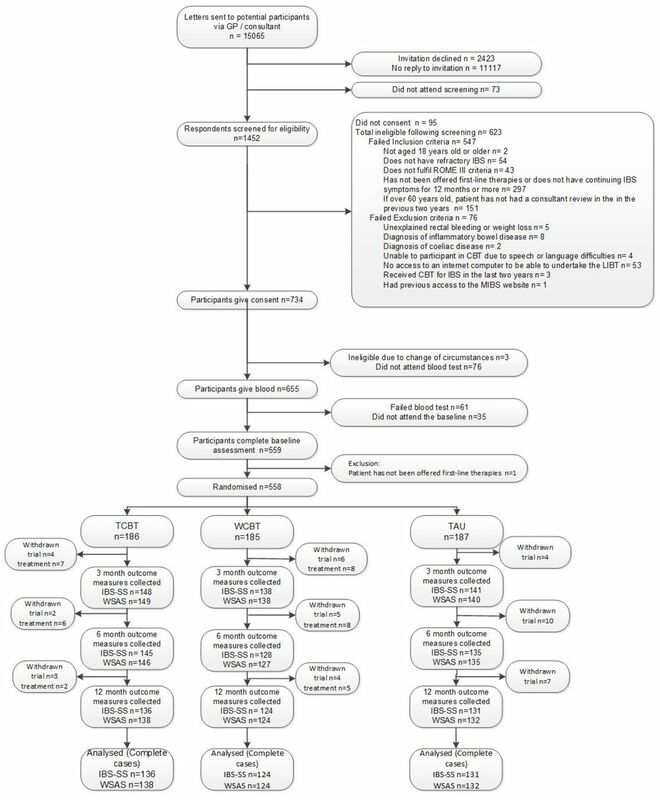 Consolidated Standards of Reporting Trials (CONSORT) diagram for Assessing Cognitive–behavioural Therapy in Irritable Bowel syndrome (ACTIB) trial. CBT, cognitive–behavioural therapy; GP, general practice; IBS-SS, IBS Symptom Severity Score; MIBS, Managing Irritable Bowel Syndrome; TAU, treatment as usual; TCBT, telephone-delivered CBT; WCBT, web-based CBT; WSAS, Work and Social Adjustment Scale. Over-recruitment relative to the original sample size calculation of 495 was undertaken (with ethical approval, within original recruitment time frame) to compensate for a lower follow-up rate than originally estimated (≈80%).9 Follow-up rates were: 76.5% (427/558) at 3 months, 72.9% (407/558) at 6 months and 70.3% (392/558) at 12 months. One-year follow-up was completed in April 2017. For TCBT arm, 84.4% of participants completed at least four phone calls. For WCBT arm, 88.1% of participants completed at least one phone call, and 69.2% completed four web sessions. Mean fidelity ratings were high and similar for TCBT and WCBT. Therapeutic alliance: mean score 93.2 (range 71.4–100.0) (SD 10.4) for TCBT and 94.4 (range 57.1–100.0) (SD 10.3) for WCBT. CBT Skills mean score 78.5 (range 46.4–92.9) (SD 13.1) for TCBT and 82.8 (range 54.3–97.1) (SD 12.1) for WCBT. Therapy adherence mean score 90.1 (range 71.4–100.0) (SD 10.0) for TCBT and 89.4 (range 42.9–100.0) (SD 15.1) for WCBT. Table 1 shows participants’ baseline characteristics. 75.8% were female, mean age was 43.1 years (SD=13.2) and median duration since diagnosis was 7.4 years (range 0.3–64.6). 10.2% had seen a GI consultant regarding their IBS. Mean IBS-SSS was 265 (SD=95.5) indicating moderately severe IBS and baseline mean WSAS score was 12.5 suggesting significant, but not severe functional impairment. Mean baseline HADS anxiety score was 10.7 (SD=4.2) with 50.7% (283/588) scoring ≧10/21 and mean HADS depression score was 5.7 (SD=3.7) with 28.2% (157/558) scoring ≧7/21.29 All baseline characteristics were well balanced between groups. Figures 2 and 3 illustrate primary outcome measure change over time by trial arm. Table 2 summarises primary and secondary outcomes and table 3 provides formal trial arm comparisons. Compared with TAU (IBS-SSS of 205.6 at 12 months), IBS-SSS was 61.6 (95% CI 33.8 to 89.5) points lower (p<0.001) in TCBT and 35.2 (95% CI 12.6 to 57.8) points lower (p=0.002) in WCBT at 12 months. Ninety-nine of 136 (72.8%) participants had a clinically significant change in IBS-SSS (≧50 points) from baseline to 12 months in TCBT compared with 82/124 (66.1%) in WCBT and 58/131 (44.3%) in TAU. IBS-SSS means by trial arm. IBS-SSS, IBS Symptom Severity Score; TAU, treatment as usual; TCBT, telephone-delivered CBT; WCBT, web-based CBT. WSAS means by trial arm. TAU, treatment as usual; TCBT, telephone-delivered CBT; WCBT, web-based CBT; WSAS, Work and Social Adjustment Scale. WSAS score in TAU was 10.8 at 12 months and 3.5 (95% CI 1.9 to 5.1) points lower (p<0.001) in TCBT and 3.0 (95% CI 1.3 to 4.6) points lower (p=0.001) in WCBT. Secondary outcome measures also showed significant improvement in both therapy arms compared with TAU at all assessment time points (table 3). For subjects’ global improvement of symptoms (SGA) 41.7% were responders in TAU. Odds of being an SGA responder were raised by a factor of 6.1 for TCBT (95% CI 2.5 to 15.0; p<0.001) and by a factor of 3.6 for TCBT (95% CI 2.0 to 6.3; p<0.001). For patient enablement (PEQ) 23.5% were responders in TAU. Odds of being a PEQ responder were raised by a factor of 9.3 for TCBT (95% CI 4.5 to 19.3; p<0.001) and by a factor of 3.5 for WCBT (95% CI 2.0 to 5.9; p<0.001). For HADS at 12 months compared with TAU (mean HADS score 15.0 [SD 7.2]), scores were an estimated 2.8 (95% CI 1.5 to 4.1) points lower (p<0.001) in the TCBT and 2.3 (95% CI 1.0 to 3.7) points lower (p=0.001) in the WCBT at 12 months. Sensitivity analyses demonstrated that: findings were robust regarding timing of refractory IBS eligibility assessment or timing of outcome recording; using a different threshold to define PEQ responders did not affect substantive conclusions; Complier Average Causal Effect, using predefined adherence criteria, revealed that efficacies for those who comply with CBT interventions were higher than the values suggested by ITT analyses (online supplementary appendix 5). There were very few serious and no intervention-related AEs; 77 were recorded in TCBT, 61 in WCBT and 55 in TAU. These were varied and split between body system codes. Thirty-five were recorded as GI AE (14 in TCBT, 10 in WCBT and 11 in TAU) and 45 were psychologically recorded as AE (18 in TCBT, 17 in WCBT and 10 in TAU). One would expect to see increased rates of reported AE in CBT arms, and particularly in TCBT as therapists completed AE forms for any AE mentioned during therapy sessions. 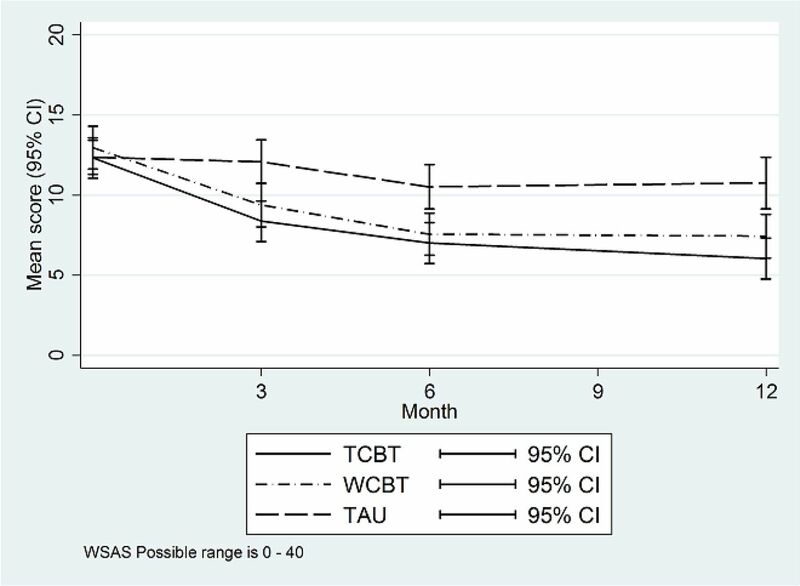 Compared with TAU, both TCBT and WCBT intervention arms showed clinically important and/or statistically significant improvements in all primary and secondary outcomes at all time points sustained at 12 months. These results indicate that both TCBT and WCBT are effective treatments for refractory moderately severe IBS compared with TAU. Trial strengths include a well-powered rigorously conducted RCT with broad inclusion and long-term follow-up. The IBS-specific CBT was based on an explicit theoretical model19 which informed detailed patient and therapy manuals and the WCBT (Regul8). Therapists were experienced in delivering CBT and trained and supervised to deliver IBS-specific CBT. Trial interventions had good treatment fidelity and were delivered by NHS therapists in an NHS setting. In terms of limitations, trial participants may not be representative of all patients with IBS. To address this, we used broad inclusive recruitment methods from primary and secondary care. However, people unwilling to consider undertaking CBT for IBS are unlikely to have participated. Encouragingly, age and gender were very similar between those invited and those randomised suggesting, on basic demographics, the sample was broadly representative though ethnic diversity was limited. Follow-up was below the 80% in the original sample size calculation despite extensive efforts, with rates of 76.5% and 70.3% at 3 and 12 months. To mitigate this and maintain power, more participants were recruited (558 compared with 495). Additionally, an ITT analysis with MI ensured valid results despite missing data. Previous research has shown face-to-face and TCBT to be beneficial for IBS6 14 15 particularly immediately after therapy. However, a Cochrane review6 highlighted uncertainty in longer term. Other large published trials of CBT for IBS report 6-month follow-up.13 30 ACTIB found large beneficial results maintained at 12 months, possibly related to the IBS-specific CBT, therapist training, comprehensive participant CBT manual and booster sessions. Significant results were found despite large positive improvements in the TAU group. A recently published three-arm RCT (n=436) compared face-to-face CBT for IBS with home-based CBT (minimal contact cognitive behavioural therapy (MC-CBT)) using self-study materials, and IBS education alone (EDU).30 They reported improvement at 2 weeks in both CBT arms compared with EDU, and on gastroenterologist (but not patient) ratings at 6 months on the clinical global impressions improvement scale, suggesting promise for low-intensity CBT for IBS. However, they only recruited participants from tertiary centres, reported 6-month follow-up and failed to show significantly greater improvements for CBT on IBS-SSS at any time point. ACTIB recruited more broadly, found large improvements in IBS-SSS and global symptoms (SGA) at all time points with 2.5 hours of telephone therapy for WCBT compared with 4 hours of face-to-face therapy in MC-CBT. Limited adherence is a concern with CBT for IBS with face-to-face6 and web-based therapy.13 31 The Kennedy trial14 which assessed nurse-delivered CBT found fewer than half participants completed therapy, 41% declining or dropping out due to time issues such as work and child care commitments. ACTIB had good adherence (84% TCBT, 70% WCBT), possibly due to telephone rather than face-to-face delivered therapy and flexibility regarding appointment times. Lower adherence rates with WCBT are consistent with research in other conditions.32 Although adherence was lower in WCBT than TCBT, the primary outcome measure changes were clinically significant and sustained at 12 months. Effects were even larger when only adherent patients were considered. Most other minimal contact IBS interventions have relied on self-referral and thus have likely recruitment biases10 13 whereas all patients with IBS in participating centres were invited to ACTIB, suggesting Regul8 with minimal contact is largely acceptable. The ACTIB findings build on results from other trials9–11 13 33 showing promise for WCBT for IBS, with significant improvements in IBS symptoms maintained at 12 months with minimal therapist input (2.5 hours). However, these were skilled CBT therapists, so it may not apply to low-intensity interventions with non-CBT-trained health professionals. Currently, clinicians have few options to offer people with refractory IBS, particularly in primary care. This study shows IBS-specific TCBT and WCBT can provide significant improvement in IBS symptoms, within an NHS setting (NHS therapists delivered the interventions). All therapy was offered remotely so could be made nationally available from specialist therapy centres. Therapists who currently work in the ‘Improving access to psychological therapy’ services (available throughout England) have suitable skills and are well placed to provide CBT for IBS. Potential treatment pathways include a ‘matched’ approach where people are offered TCBT or WCBT based on initial assessments or a ‘stepped care’ care approach where all patients are offered lower intensity WCBT and therapist input is considered as required. We are undertaking a process evaluation to explore which form of CBT is most appropriate for which patients with IBS. Future publications are planned on the cost-eﬀectiveness, a nested qualitative study of participant’s perceptions, investigation of moderators and mediators of CBT effects and longer term follow-up. Further research is needed to assess whether TCBT and WCBT can be widely disseminated in non-trial clinical settings. This large rigorous trial of CBT for IBS found that both CBT arms were superior to TAU at 12 months. This trial reinforces NICE guidance,3 which currently relies on a limited evidence base of mostly face-to-face CBT, that patients with refractory IBS can benefit from CBT for IBS and that telephone-delivered (TCBT) or web-delivered (WCBT) can provide sustained improvements.
. Care of patients with gastrointestinal disorders in the United Kingdom: A strategy for the future. Brit Soc Gastroenterol 2006. NICE. Irritable bowel syndrome in adults: diagnosis and management of irritable bowel syndrome in primary care. NICE 2015.
. and Depression Scale: a meta confirmatory factor analysis. J Psychosom Res 2013;74:74–81.
. Multiple imputation using chained equations: Issues and guidance for practice. 2010. Index of Multiple Deprivation Score, 2010. 2015 https://data.gov.uk/dataset/98bd6fd3-d726-45fc-b415-cf8c91f7098b/index-of-multiple-deprivation-score-2010. TC and RM-M contributed equally. Contributors The principal investigators (HAE, RMM and TC) and the other coapplicants (PMC, PL, SL, FB, RL, NC) designed the study and obtained funding. The protocol was further developed by the Trial Management Group (TMG) and agreed by the Trial Steering Committee (TSC) and Data Monitoring and Ethics Committee (DMEC). The TMG, chaired by HAE, included all the authors of this paper and Jill Durnell and Kate Riley, the PPI representatives. The statistical analysis plan (SAP) was developed by KG, RH and SL, discussed by the TMG and DMEC and approved by the TSC before database lock. RH and SL carried out the main statistical analyses. The Regul8 website was previously developed in the MIBS NIHR RfPB funded study and was managed and updated for this study by SH and AS. TC and RMM developed the therapy protocols and treatment manuals, and trained and supervised the trial therapists. RMM led the website arm and TC the therapist arm. The CBT therapists were Suzanne Roche, Mary Burgess, Barbara Bowman, Natalia Fainblum, Fabio Simao, David McCormack, Caroline Stokes, Antonia Dittner, Claire Willis and Jerome Tierney. Independent assessors of therapy fidelity were Alison Griffiths and Sarah Lack. The chief investigator was HAE and the trial manager was GOR. SH, AS and SW were the research assistants. HAE led the primary care recruitment. NC and RL were clinic expert advisors and led the secondary care recruitment at Southampton and London, respectively. All authors contributed to this manuscript and approved it prior to submission. All named authors commented on drafts and approved the final report. Members of the writing group had responsibility for submitting the report, and HAE had the final responsibility for the decision to submit for publication. Funding The project ACTIB (Assessing Cognitive–behavioural Therapy in Irritable Bowel syndrome)—a randomised controlled trial of clinical and cost-effectiveness of therapist-delivered cognitive–behavioural therapy and web-based self-management in irritable bowel syndrome—was funded by the National Institute for Health Research (NIHR) HTA Project: 11/69/02, with additional support from the NIHR Clinical Research Network. This paper represents independent research with some staff part funded by the NIHR Biomedical Research Centre at South London and Maudsley NHS Foundation Trust and King’s College London. Disclaimer The views expressed are those of the author(s) and not necessarily those of the NHS, the NIHR or the Department of Health and Social Care. Competing interests PL is the director of PGfAR and a member of the Journals Library Board. RMM reports personal fees from training in IBS intervention for Central and North West London NHS Foundation Trust and University of East Anglia, outside the submitted work. TC reports grants from Guy’s and St Thomas’ Charity. She was a faculty member, Third International Conference on Functional (Psychogenic) Neurological Disorders, September 2017, Edinburgh, member of the IAPT Education and Training ERG (2016–), member of the IAPT Outcomes and Informatics Meeting (2016–) and president of the British Association of Behavioural and Cognitive Psychotherapies (2012–2015) for which she did not receive payment. Workshops were delivered on medically unexplained symptoms, during the conduct of the study (money paid into KCL for future research). TC has a patent background IP—manuals were developed prior to trial starting. SL and KG report grants from NIHR. The TSC chair, PW, was a colleague of TC in the past but he has recently retired. RMM reports personal fees from training in IBS intervention for Central and North West London NHS Foundation Trust and University of East Anglia, outside the submitted work. Since this study was submitted, she has received payment for consultancy to Mahana Therapeutics. The CBT patient and the therapist manual used in the telephone CBT arm are freely available on the National Improving Access to Psychological Therapies (IAPT) for LTC/MUS website as part of evidence-based resources for IAPT. The patient manual is background IP developed by CI’s RMM and TC in previous work. The therapist manual was developed for the ACTIB trial. These manuals were only made available once the 12-month ACTIB follow-up was complete. HAE, FB, GOR, AS, RH, SL, SH, SW, PMC, NC and RL have nothing to disclose. Ethics approval NRES Committee South Central, Berkshire, June 2013 (13/SC/0206). Data sharing statement The lead author (HAE) can be contacted regarding data sharing requests. Collaborators ACTIB trial group: Trial Steering Committee (independent members): Peter White (chair), Else Guthrie, Qasim Aziz and Tom Sensky. Data Monitoring and Ethics Committee (DMEC) (independent members): Astrid Fletcher (chair), Charlotte Feinmann and Ronan O’Carroll. Patient and public involvement (PPI) member on TSC and DMEC: Jill Durnell. Trial management group PPI member: Kate Riley.